Incepted in 1984, Hitesh Steels India has emerged as the renowned exporter and wholesaler of exclusive range of industrial pipes, tubes, fittings, flanges, sheets and fasteners. 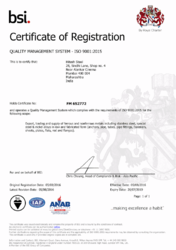 We are an ISO 9001: 2008 certified company. With our vast experience in the field, we have been providing undoubtedly the best product range in the industry which has been remarkable in terms of durability, functional efficiency, corrosion resistance and precision dimensions. Our products have received accolades and appreciation in the global market. Apart from that our range has been approved by the esteemed ASTM & IBR standards. The special product range offered by us comprises of an exclusive range of Monel Pipes, Monel Tubes, Monel Buttweld Fittings, Monel Forged Fittings, Monel Sheets, Monel Plates, Monel Fasteners, Monel Flanges, Monel Round Bars, and Hastelloy Pipes apart from a range of Hastelloy Tubes, Hastelloy Tubes, Hastelloy Buttweld Fittings, Hastelloy Forged Fittings, Hastelloy Plates, Hastelloy Fasteners, Hastelloy Flanges, Pipes, High Nickel Based Super Alloys and many more. We offer our product range at very competitive and nominal prices in the global market. The entire range of products is manufactured from the best quality raw materials procured from trusted dealers. Our products are thoroughly quality checked at regular intervals. We have the provision of third party inspections which is conducted by highly reputed organizations like Modvat Benefit. They perform brick-walled checks of our final products that add to our efficiency and quality compliance. Successful in providing client satisfactory services, we make consistent efforts to ensure quality, durability apart from making sure that our products are manufactured from standard quality raw material. Well-known in the industry for manufacturing,exporting, importing and supplier of quality range of Pipes, Tubes, Fittings, Flanges, Sheets, and Fasteners, we pay utmost attention in procuring these products from trusted vendors. Owing to our vast industrial experience, our vendors serve us with the required quality and quantity of Industrial Supplies whenever needed. Before procuring our range, we ensure to test the products at manufacturers' premises and recheck these in our own quality management department. This helps to ensure that the range of Industrial supplies offered by us stands high on quality and performance as per industrial standards. Our constant evaluation of vendors ensures that we are on the right track of getting optimum quality products to maintain strong business relation with our clients. All these features have enabled us to win the trust and faith of our valued clients based at various parts of the globe. Leveraging our capabilities to export and supply world class products, we have a state-of-the-art infrastructure constituted by world class facilities and machineries. Spread over a huge expanse of land our unit is well-equipped with a wide range of machinery and equipment. Machinery and equipment, we employ for the process of production, quality check and design are of high-quality and deliver the maximum output quickly. We are fortunate to have the team of experienced professionals with us who are specialists in their respective fields and are instrumental in the success of our organization. The dedication and sincere efforts of our team have enabled us to serve our clients with a high-quality range of industrial supplies. Our team consists of quality analysts, engineers, technicians and other skilled and semi-skilled man power.